Fig. 1. 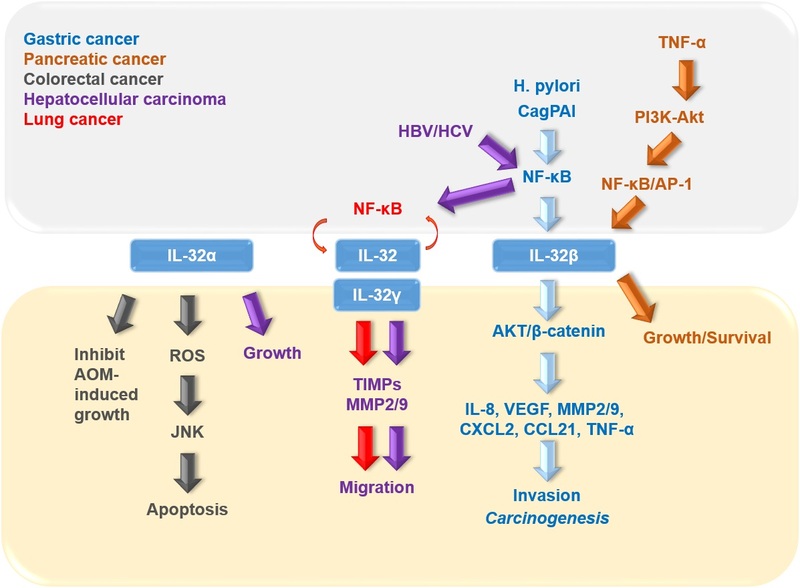 Biological functions of IL-32 in inflammatory tumors. Different colors indicate each cancer type and cancer type specific signaling pathway. AOM: azoxymethane, ROS: reactive oxygen species, JNK: c-Jun N-terminal kinases, NF-κB: nuclear factor kappa B, TIMP: tissue inhibitors of metalloproteinase, MMP: matrix metalloproteinase, H. pylori: Helicobacter pylori, cagPAI: cytotoxin-associated gene pathogenicity island, HBV: hepatitis B virus, HCV: hepatitis C virus, VEGF: vascular endothelial growth factor, CXCL: C-X-C motif chemokine, CCL: C-C motif chemokine ligands, TNF-α: tumor necrosis factor α, PI3K: phosphoinositide 3-kinase, AP-1: activated protein 1. 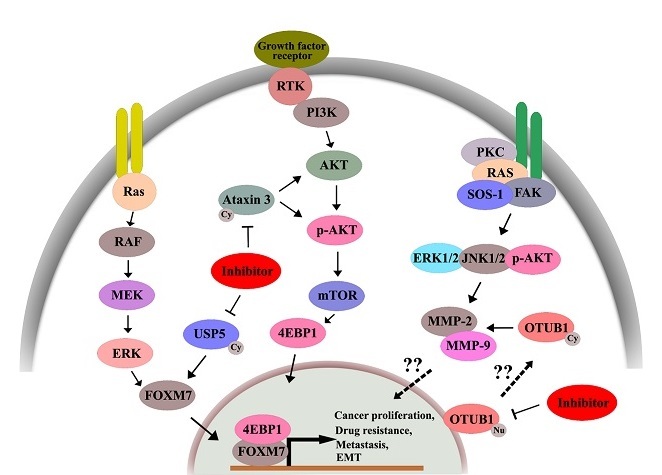 Deubiquitinating enzymes as cancer biomarkers: new therapeutic opportunities? Fig. 2. DUBs involved in the regulation of oncogenic pathways. Inhibition of specific DUBs leads to decreased cancer proliferation, drug resistance, and delayed metastasis. Online First articles have been peer reviewed, accepted for publication and published online; they have not yet been assigned to a journal issue. When these articles are published in an issue, they will be removed from this page. Online First articles are copy-edited, typeset and approved by the authors before publication. Sunhwa Oh, Hyungjoo Kim, KeeSoo Nam, and Incheol Shin. Won-Tae Kim, and Chun Jeih Ryu. Soo Jin Kim, and Ho Min Kim. Kiyoung Eun, Seok Won Ham, and Hyunggee Kim. Kyoung Mi Kim, Ji Heon Noh, Kotb Abdelmohsen, and Myriam Gorospe. Md. Ataur Rahman, and Hyewhon Rhim. Mi Hye Song, Varun Sasidharan Nair, and Kwon Ik Oh.